Before applying new striping, parking lot sandblasting the most effective way to remove old paint. C & D uses sandblasting on concrete, brick, and metal surfaces. This creates a clean, prepared surface for the new striping paint to adhere to; and more professional looking results. 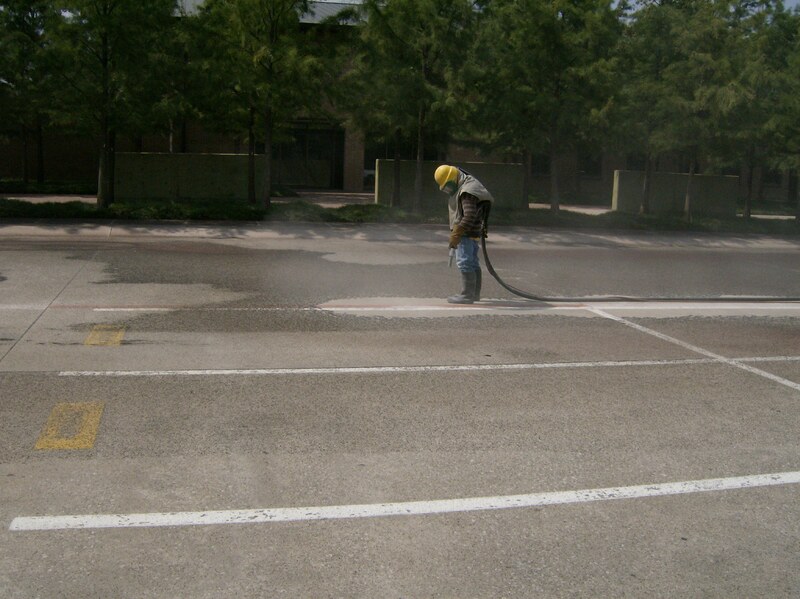 We can remove old paint in a parking lot by either sandblasting, grinding or power washing. The method we use depends on the application. Sandblasting is the most effective way to remove old paint. We normally sandblast when a parking lot has been striped over and over again and the older base layers of paint are chipping, curling and peeling. Sandblasting removes all this paint and creates a good surface for the new paint to bond to. The disadvantage is that sandblasting is expensive and surrounding areas must be protected from the abrasive sand. Grinding is used in smaller applications or in areas that are sensitive to sand and dust. For instance, if we are removing a few reserved parking stencils in a parking garage, we will likely use a grinder. Power washing is used to prepare to re-stripe a parking lot when there are thin layers of parking lot paint chipping and peeling but it’s not pervasive. This method removes the chipping and loose paint so that a new layer of paint can be applied on top. Our parking lot sandblasting service is unique. Instead of using sand, which contains silica and can cause health problems (such as silicosis) when the dust is inhaled, we use a health-friendly material called Green Diamond, which contains very little silica. We use a dry sandblasting process, which uses compressed air instead of water. 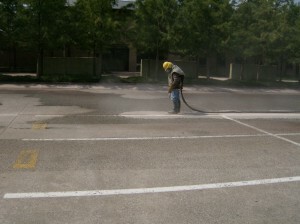 This adds to the cost effectiveness and efficiency of the parking lot sandblasting process. It’s also a more Eco-friendly process than using water, as the Green Diamond blast media can be recovered and re-used.